Sometimes it's dangerous to get what you wish for, like in those fairy tales where someone’s wish is granted far too literally and it all goes horribly wrong. 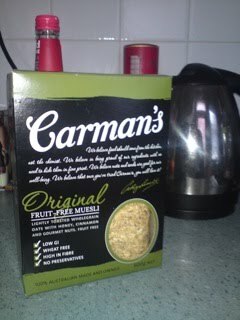 On twitter I was discussing my dislike for raisins and sultanas from previous muesli reviews and I got a couple of messages about it - one from someone in Australia talking about how much I'd love Carman's fruit free range. This resulted in a short exchange of messages and a box of the muesli appearing from Australia! As this is a muesli with no fruit, not even the nice ones like all the berries AND no chocolate flakes AND very few nuts I was worried that I'd had my wish over granted and that I'd got a box of flavour free oats. This wasn't to be the case, there are hints of other flavours, and like the Dorset Cereals there are lots of lovely seeds that burst with flavour to find hiding in your mouth for hours after breakfast . I'd fully expected to be adding some of my dried cranberries and strawberries to this after the second bowl, as I have done with the own supermarket brand mueslis in the past, but I think that would spoil the delicate balance of flavours. This is designed to be eaten without fruit and is perfect for anyone as picky as me! In the commonwealth games of cereals I'd say that this is the most elegantly done of the plain mueslis I've tasted, and is more similar to a granola in flavour as there is a definite roasted taste hiding in there. It deserves a place in the UK luxury cereal market and hopefully will find its way into more supermarkets so more people can try it out. I also have the Carman's cereal bars but will save those until after Xmas I think!